We love to watch videos online and our flash player works perfectly with alternative browsers like Mozilla Firefox and Google Chrome. But sometimes it does not work with Internet Explorer. We try to run tests but Adobe’s system is unable to detect what’s wrong. There are two methods to fix this. One by updating some settings and other is via command prompt. Method 1: When trying to play a video on internet explorer you can get this kind of screen. Open Internet Explorer and then go to any website with flash content; such as YouTube. Press Windows Key + X keys or click the gear icon at the top right corner of browser window. Click Compatibility View settings. In the Compatibility View Settings window, add the sites we’re having issues with showing flash content. Before clicking Close, make sure you have checked the options at bottom; Display intranet sites in Compatibility View and Use Microsoft compatibility lists. Restart the Internet Explorer and the problem should be fixed! 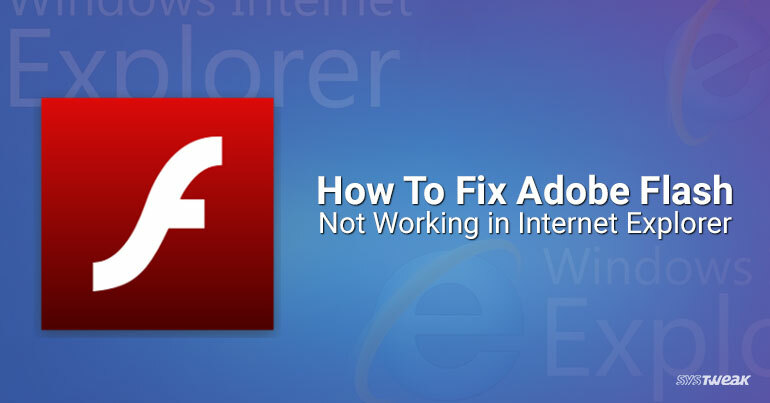 Method 2: we can resolve this issue by re-registering the flash.ocx file in System32 folder because if this file is not registered properly it can create hindrance in running the flash player. On entering the above command, it will re-register the flash.ocx file, and we will see this confirmation box. Click OK. Restart the machine, open Internet Explorer and you will find that the issue has been resolved. Now those error messages will not irrupt you when you are browsing.